Hey, Alan. I followed your steps, but only got a subtitle with all lines with “TEXT HERE”. Any idea what I did wrong? Not sure, but it may be an issue with the format of your images. If you could upload a few of them somewhere with the xml file I could take a look. I have a Blu-ray sup file that gives a real mess when OCRed with Subtitle Edit. It’s much better with your tool, but there are still a lot of errors. I guess OCR has still a long way to go. Anyway, thanks, this will be very useful for hard files like this one. According to the error, it’s saying it didn’t locate an XML file in the folder that you selected. Your input needs to contain both png images and an xml file. Thanks, I did not notice that Subtitle Edit generated an XML file before moving the PNG files into a specific directory. It says now that Cloud Vision API has not been enabled, I’ll have to sort that out. The Google interface is far from user friendly! I already enabled Google Vision API but it says: “Failed to execute script PNG2SRT”! 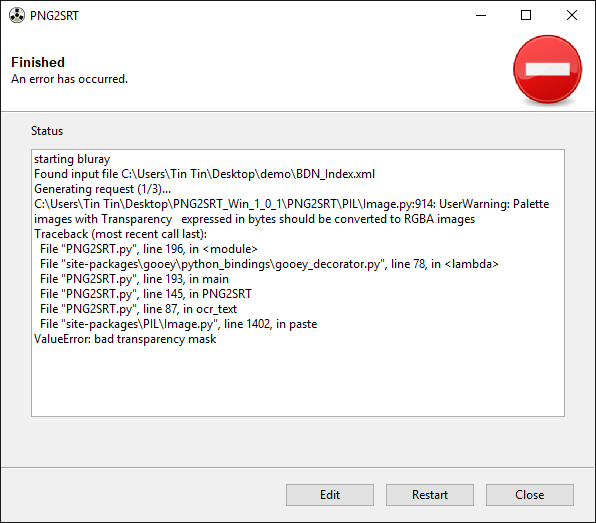 The actual error will be in the status window behind the popup “failed to execute script”. You need to see what that says. Looks like its a problem with the format of the images you are trying to use. Mind uploading your original subtitle file somewhere, plus a few of the png files you are trying to use? I’ll try to check it out and see if I can figure out whats wrong. I am so sorry didn’t tell you details about my case. I use VideoSubFinder (https://sourceforge.net/projects/videosubfinder/) to extract the hard-subtitles from videos, not extract subtitles from DVD. I have some Chinese subtitle pictures with background (not transperency). I want to use your tool to get the OCR subtitles file. Can you edit your script to solve this? So, the program can work with not only the transperency pictures, but also the pictures having background? I think the main problem here is that your images are all JPEG files, and this software is only designed to work with PNG images. If you can convert your images to PNG, it might work. For Linux, you can download and run the source code, its just a single python file. You will need to make sure python 3 is on your system (most linux distributions include python, but some of them only include python 2). You also need 3 python packages: Requests, Pillow, Gooey. Some googling should show you how to install them. I tried use this tool but i just get in the SRT the text is .. I was trying to format from hebrew and I tried “iw” and “he” as well but got no lucky. Question…. i’m trying to sign up for Google Cloud Platform and its asking me for my credit card info without stating the cost. The last thing I want is to enter my credit card info and end up spending thousands just to convert PNG into Chinese subtitles for Love 020 so I can watch it on my phone on my way to work. 1000 images free a month, each 1000 after that is $1.50. They are still offering a free $300 credit when you sign up, which goes a long way. Does this tool work with arabic subs through google ipa? I think it doesn’t work very well with arabic. what could I do to fix that ? Please post an example of the output you are getting. And what operating system are you on? Could you please OCR this for me from Japanese? I don’t have a credit card to sign up for the Google thing. Hi, could you please OCR this Arabic subtitle and upload the SRT file, thanks. Or please OCR this less images one, it has only 20 images, just to test the OCR with this font to check if it will work fine or not. sorry for this but can you try this for persian/farsi subtite? Seems to be working, you just need to type “fa” as the language code to use. The accuracy of the OCR doesn’t appear to be very good though, with it leaving several lines blank. Is it possible for the OCR to recognize symbols? The music symbol is in many of my subtitles and it is wrongly OCR’d as a bunch of random letters. Very useful program btw – thanks. Thank you very much for this post and the tools you’ve created!! I work with Arabic and this post saved me! Appreciate the hard work! I have two copies of the same video — one with hardcoded subtitles and the other with no subtitles. How do I get the hardcoded subtitles into the XML/PNG format? Thanks. I’m wondering, instead of converting to srt files, if there’s a way to create sub/idx files from the images, xml, and idx extracted from netflix with the script you suggested? I googled about creating sub files, but I only got how to converting sub to srt or sub to images etc, not images to sub. First, I have to thank you for this tool, because it’s exactly what I was searching for to convert Japanese vobsub files from DVDs. Anyway, I’m using it on a Mac (using the Windows version of Subtitle Edit through Wine) and I have a problem with movies that have more than 615 lines of subtitles. Under 615 lines everything is ok, and I can obtain my .srt file, and it’s perfect. The same happens if the chunk size is set to 5 (it stops at chunk number 123). And it happens with different files and movies. I don’t know nothing about Python, but the fact that it always stops after line 615 maybe could mean something to you? I don’t know, something regarding memory, maybe? Something related only to the Mac? That’s interesting, I have not encountered this error before. Can you post up a link to your sub/idx for me to download and test? (it’s sub/idx and the folder with xml & png too). I’ve only tested the DVD functionality on one or two discs, so if its a problem of length, mine might not have been long enough. I’ll see what I can find out. There could be a limit set by the Google servers when there are more than 600 requests? After some investigation I discovered that the problem is indeed caused due to this program exceeding 600 requests per minute, which is a limit set by google. In order to solve this, I have tried to build in a simple delay to slow it down a bit. I will send you an email with a new build that you can test. Unfortunately I can not test it myself, as I no longer have any available quota for this month, and I don’t want to have to pay money for further testing. It works, Alan! It works! I’ve tested it on two files (one from DVD and one from BD, 960 and 1.035 lines), and everything went well. So, thank you very much for your fast solution! i have problems with version 1.0.0, when will version 1.0.1 be available? Hi, Thanks for this great post about subtitles extracting. I just tried following the instructions but getting same errors as EDDIE’s. Signed up the api thing with a new account and it finally worked! Probably I made a mistake getting an api key before. Thank you so much for the post and png2srt! It really helped me a lot. its seems like the key is working but it gets some error, how did u sign up the api? Have you verified that the api key displayed in the top of the window matches your api key exactly? My best guess for this error would be an issue with the api key. I’m not sure what could be causing the problem then. If I release a new version, I’ll add some additional error checking to help narrow down the cause of problems like this. Hi. I’m planning to do a like quest for me to jump into reading a cooking book in japanese. Do you think I could put this tool to work with pages (recipes)? Eventualy I would scan the whole book, but I was plannning a recipe at a time. If you upload an image to google drive, then open it in google docs, google will do the ocr on it. It’s very difficult to enhance my tool to make it useful for books, because the most difficult part is the formatting. Something as simple as furigana over the text or having text in multiple columns can put the text in an order that is very difficult to read without constantly getting lost. So this trick with google drive is probably your best option for now. I wonder if it’s possible to convert manga images in a similar fashion? For my case the output doesn’t have to be properly readable. I’m really just interested in creating a list of the most common words so I can know where to focus my learning. Maybe there’s already a tool out there to achieve this? For that case, I would recommend just using anime scripts if there is an anime version of the manga you are looking at. The dialog is often fairly similar and will have a lot of the same words. This tool probably wouldn’t be very useful for such a case, but the code might be a decent starting point to create something from, if someone were interested in doing so. Anime scripts/subtitles are what I’ve been using up to now. There are a lot of manga that I want to read (or am reading) that don’t have this option though, so I thought it could be useful to try extract the text. As for the linked tools, they don’t seem very suited to say, extracting the text from a whole manga series and outputting it to a text file. That and, as far as I can tell, the Google Cloud Vision API is the best OCR engine out there at the moment. Bravo!!! thanks for all the hard work. Will try this new tool. But already very happy with the “old” one as well. Netflix has becomed my well of (japanese) wisdom thanks to this nifty tools. Glad you are finding it useful. If you are just using it for Netflix content, you wont really find any improvements though. This new one basically just adds support for DVD and Bluray, so I decided it was time to change the name as well.